When I first started writing this post I sent a picture of the text I had written so far to my housemate joking which jokingly read "It sucked". It's hard to really start and put into perspective as to how this years gone but I'm going to try and break this down in, hopefully, a fathomable way. Definitely not how that saying should go. It feels like only yesterday I was moving into my second year house and readjusting to uni life. We were warned about this year from older Psychology students that it would be tough but I don't think any of us were really prepared for it. Before I knew it, Christmas exams were here and I didn't have time to prepare for the term from hell that waited around the corner. With a jam-packed second term with a deadline a week and 9am lectures on the daily, I was starting to believe that what everyone had heard about uni wasn't true. I had no time to enjoy myself. The term flew by and not in a good way. I don't think I properly breathed until that last assignment for second term was handed in. And even then, all that meant was summer exams were fast approaching. It's strange to think that next year I'll already be in third year. Compared to some subjects, I had something on almost every day of the week . If I wasn't in uni, I was at my part-time job in town or I was with my housemates. I kept myself busy enough to not have time to think about missing home or missing friends. But then, the off day that I didn't have work, I didn't have lectures and my housemates were busy, it was strange to sit in my room and think. I can be surrounded by familiar, friendly faces and yet still feel a little lost amongst it all . I wrote a post years a go called "ALONE vs. LONELY" and that post still resonates with me today. Times when I'm alone I love, it gives me time to relax. But at points, it can be lonely even if you try and stay busy. I know it's something a lot of people struggle with at uni and I found it particularly hard this year. Every uni student that has gone through Freshers knows about signing up to a hundred and one different societies and events that you think you'll definitely be going to throughout your time at university. Most also know that your attendance at these, even after countless emails, is most likely not going to happen. For me, nothing changed in second year. I wanted to make time for societies and events but deadlines took over and so did my job. It isn't really until now with the year finished that I realise how much I feel like I missed through having a job and a course that has so many contact hours. It's nice to know that some hard work does pay off. While I'm yet to get my official end of year result, there were times where, throughout the year, I surprised myself with the marks on essays and reports I was getting. While my end of year results weren't as high as I would have liked, they were still good and I know I'm being hard on myself when I say they weren't good. I was scared that having a job in second year would really hurt my grades and, maybe it did a little, but I turned out pieces of work with the highest scores I've ever got. It confirmed in me that what I'm doing is the right thing and that I chose well coming to uni to do Psychology. Having a good group of friends at uni, I feel, can make or break the uni experience and, for me, I'm lucky to have met some lovely people along the way. You might be familiar with the first year mistake of living with the people you lived with in first year, in second year but learning to hate them along the way. Thankfully, this hasn't happened in my house. Yes, they're annoying at times, but who isn't? While we have decided to live in different houses in third year, I can guarantee I'll be nagging them for movie nights and trips out next year. We've grown a close little group that have become so comfortable with each other. Some of the best memories of this year haven't been anything extravagant but been one's where we've spent the evening curled up on the sofa talking and laughing at awful jokes and watching films. While I'm not a soppy person, If you're reading this, just a little thank you for putting up with my weirdness, listening to me babble on about things you aren't interest in and making me laugh every day of the year. It was also nice to have a close knit group of course friends. They were a support system going through exams and knowing and it was reassuring to know we were all at the same point when the stress level hit new heights during the year. While in third year we are all split off into different modules, there's no doubt that we'll still be meeting regularly. I'm so happy to have a solid group of girl friends that I can rely on. It's hard to know whether the pros have outweighed the cons of this year. I'm so lucky to have the opportunity to be at uni and to have great friends come with it. However, it's hard to know if I'm really yet to embrace the opportunity I've been given. Only time will tell, as I head into third year, if it's all been worth it. 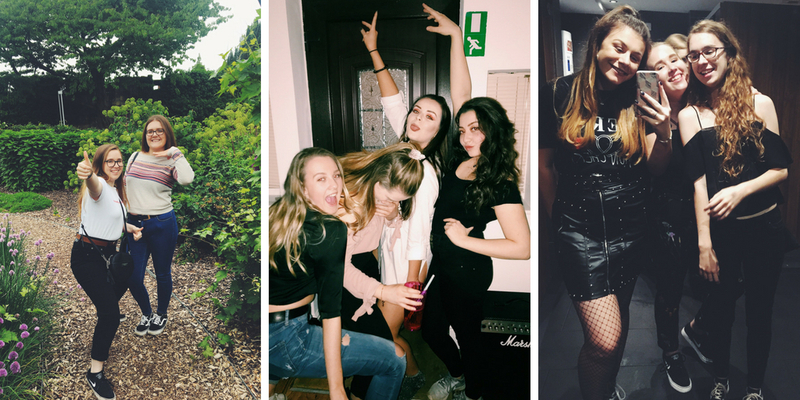 I hope you enjoyed this post and I'm hoping to be giving you some more uni-related posts over the coming months in preparation for anyone going to uni this September in hopes that it may give you some honest insight into uni life. Are you a student yourself? Was there anything you found challenging about your time as a student? With it getting warmer, it's time to change things up with this lightweight, budget-friendly make up. While the weather is getting warmer and my skin is less dry, I still need the extra hydration so, as well as moisturiser, I always like having a moisturising base that also helps my foundation go on smoothly. The Barry M Flawless Original Primer is great for just that. It's a simple primer that helps in simple ways and that's all I need for a day-to-day basis. This also gets extra brownie points for the great packaging; it's so much easier to pump out compared to tube primers and you can get every last drop out of it. A new addition for me this summer is the Revolution Pro Foundation Drops in F1. It's a great lightweight primer for summer with surprisingly good coverage for how thin the foundation comes out. I do think the packaging is slightly gimmicky but I think it works well for this product due to its very runny formula. It reminds me a lot of the L'oreal True Match foundation I used to adore so it's great that I've found a similar cruelty-free alternative. Daily, when I'm in a rush, I tend to use a buffing brush such as my ELF Foundation brush but it also works great with my Real Techniques Beauty Sponge which gives a more flawless, dewey base. There are always bits foundation doesn't cover as well. So for those pesky parts, the new(ish) and highly demanded Revolution Conceal and Define Concealer in C1 comes in very handy. It's great for both highlighting under eyes and concealing any blemishes the foundation didn't manage to cover. Next, I'll usually do eyebrows and I keep it quick and simple with my Freedom Eyebrow Powder Duo in Ash Brown. They have a great selection of shades at a super affordable price. It's definitely one to check out. Daily, I choose to just opt for an overall bronze and, for this, the extremely affordable Natural Collection Bronzer in Copper is great. It gives a decent amount of warmth while not being too orange for my fair face. I'm not usually a fan of bronzers that contain a bit of shimmer but I actually like the bit of flex that runs through this bronzer. I don't find it to be too overwhelmingly shimmery but still giving me a little something that saves me time on adding highlighter aswell. If I have time, I also like to apply this across my eyes to just add a little more colour. Mascara is usually the step I skip during the summer months because I know that my eyes are most likely to stream throughout the day making mascara quite pointless. But, if I do, the Barry M Showgirl Mascara is a great one for length and a natural curl. Finishing off, I've been loving this Pixi Shea Butter Lip Balm in Natural Rose. When I bought this I was expecting something similar to the Maybelline Baby Lips but it's actually much more of a thick, lipstick-like consistency. While it isn't what I expected, it's actually still really moisturising which is great and definitely a lot better than the Baby Lips I used to own. So there's the make up I'll be opting for this summer when I want something more dewey and lightweight. Have you tried any of the products mentioned? 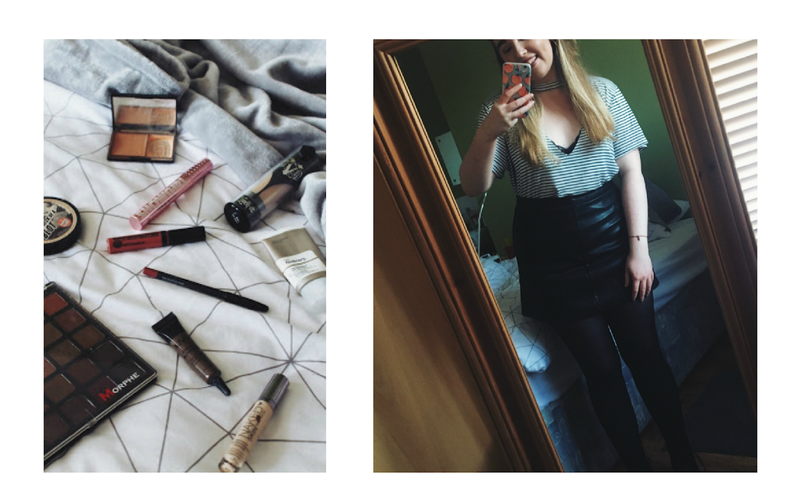 Here's a "day in the life" style post about what I get up to on a usual day at uni! The majority of the year this would be spent lounging around and avoiding doing any work as I slowly get ready for later lectures. However, it was getting close to exam season so I was up bright and early to get cracking on some revision. I had my breakfast, got dressed and headed out. It's slowly getting a lot more sunny but still a little bit chilly so I threw on these Pull & Bear Basic MOM Jeans (buy here) and then my new Pull & Bear striped jumper (buy here). I went for My Adidas Gazelles (buy here) because they're super comfy. 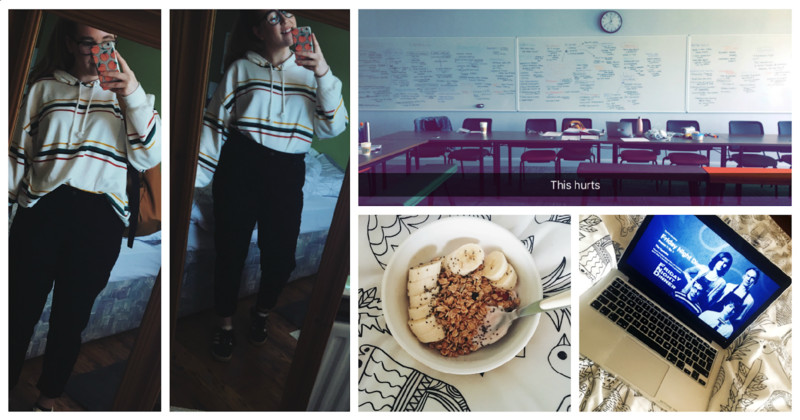 I always take my Carhartt backpack (similar here)with me as well as it fits my abundance of revision notes, laptop and lots of snacks for the day! I've recently found working in the student spaces on campus a lot better than just working in my room at the house so I headed there with a friend. 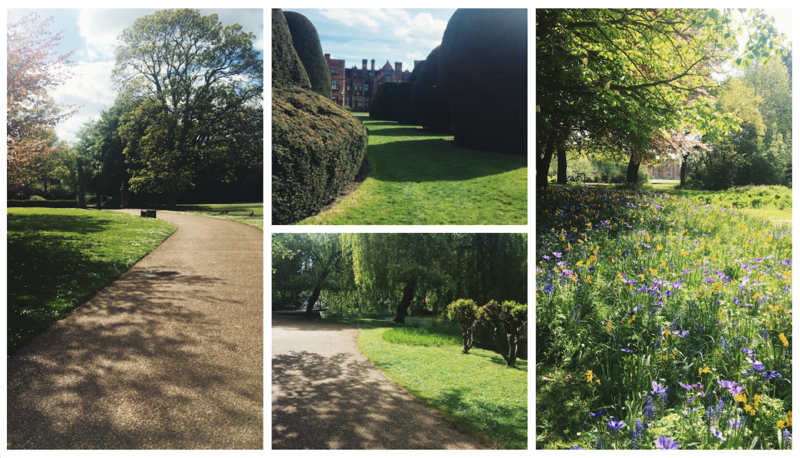 After a morning of revision, we had a lecture in the afternoon so caught the bus over to main campus where, with the weather looking so nice, decided to take the scenic route through campus. After the lecture, I headed back home where I did some easy work before having tea and getting ready for the evening. It was one of my friends birthday's on this day, so we decided to have a last night out before exams. I decided to wear this leather-style skirt from New Look (see here) along with this TOBI Striped tee*(buy here). I decided to wear a black bralette (found here) underneath which I felt actually added to the outfit! With it still being colder in the evenings I went for tights and black boots from ASOS (similar here) which I soon decided to change to my Black Nikes (buy here) because, why not! It was a really nice night to finish on before the real exam stress kicked in. But, it didn't stop me from getting up for lectures the next day! All items marked with a (*) were kindly gifted to me. However, as always, all opinions remain my own!